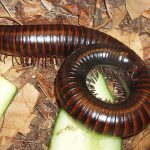 Millipedes are typically found in moist vegetation, leaf litter, trash, grass clippings and mulch. Although several millipedes may be found outside buildings, some may get inside your home. Millipedes do not usually survive indoors for more than a few days unless there are high moisture conditions and a food supply is present. They will survive indoors in moist basements and crawl spaces. Under the right conditions, millipede “migrations” can occur. This is where the moisture in their outdoor habitat dries up and they search for better living conditions. Hundreds to thousands of millipedes will search for a new location. Millipedes will gather around porches and patios around homes. They gain access to the inside of the home through the foundation basement doors and windows, crawlspace vents, and garage doors. Many times millipedes in are found under furniture or boxes in basements. Millipedes are also found in crawl spaces where there is moisture and they feed on decaying wood and dead leaves. They can enter the home from the crawl space through the floor and can also crawl under doors that don’t have weather stripping.